The University of Delaware College of Engineering invites students to participate in a National Academy of Engineering video contest. 8:45 a.m., Jan. 13, 2015--The University of Delaware College of Engineering invites students to participate in a National Academy of Engineering video contest that focuses on the century’s challenges and solutions. 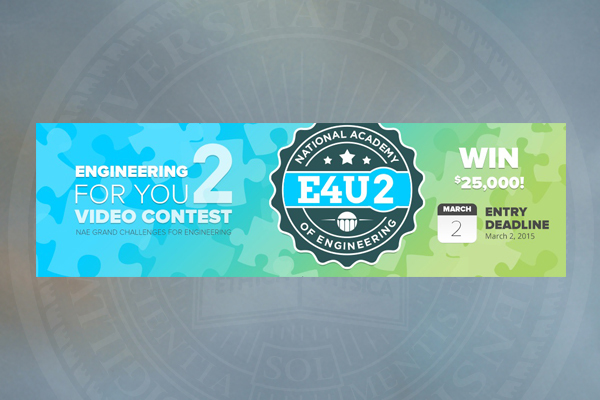 The contest, Engineering for You 2, asks participants to review the National Academy of Engineering’s grand challenges – 14 game-changing opportunities for the 21st century – and create and submit a one- to two-minute video that show how achieving one or more of those challenges will lead to a more sustainable, healthy and secure world. Submissions are now being accepted and the deadline for entries is March 2. A grand prize of $25,000 will be awarded to the student or students who create the most inspiring video. For details, visit the Engineering for You 2 website.